Johnny has loaned me a box of old letters, and I’m just beginning to sift through the crispy paper decoratively topped by the fading ink of fountain pens and three cent stamps. 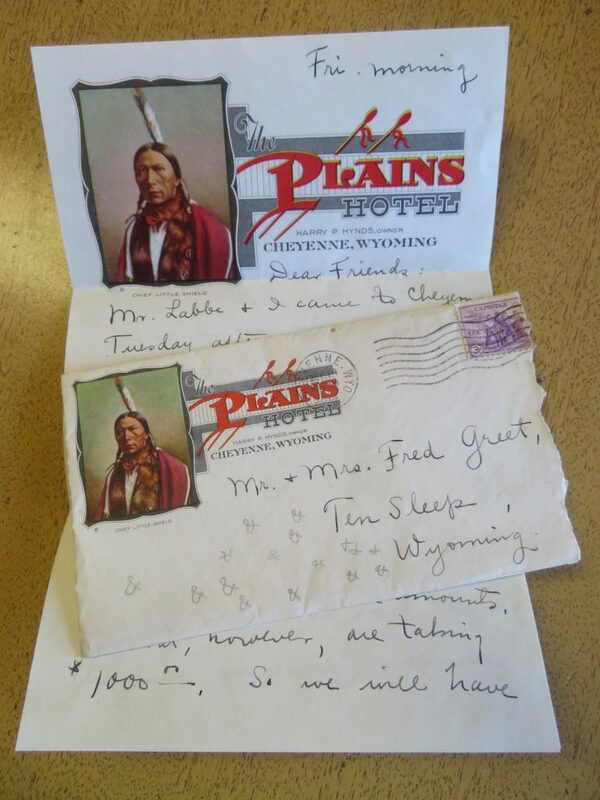 My eye was caught by this stationery from the Plains Hotel in Cheyenne. Who wouldn’t want to write on this? And then frame it later? For those of you who think snail mail letter writing is a thing of the past… I’ve recently met Helen over at AnchoredScraps.com. She promotes letter writing, wonderful pens, stationery, stamps, and postcards! (And me on my tenth blogoversary!). Check out her website and break out a good pen and some stationery and write someone a memory! What great, unique stationery they had in those olden days! It must have been thrilling to write someone a note on that paper and send it to someone back east!